Review posted July 13, 2018. Carolrhoda Books, 2017. 36 pages. Niko likes to draw feelings. where it would escape onto his paper in a whirlwind of color. No one understands Niko’s drawings and what they mean. If he draws the hard work of a mother robin building her nest, they expect to see a bird or a nest – not hard work. If he draws the warm of the sun on his face, they expect to see the sun or his face, not the warm. His friends don’t understand. His parents don’t understand. His teacher doesn’t understand. But then a girl named Iris moves next door, and she gets it. 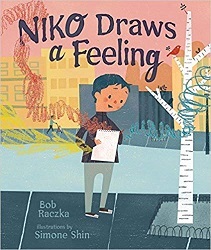 When she looks at Niko’s drawings, she feels something. The next thing Niko draws is the feeling of friendship. I didn’t expect to like this book as much as I did. Honestly, I’m still a little skeptical about drawing feelings. And a little skeptical that this new girl could catch on so well. But – there’s something about that feeling when somebody finally gets you. This book delivered that feeling and warmed my heart.